In the immortal words of Barney Stinson; character played by Neil Patrick Harris on the CBS television show “How I Met Your Mother”, “challenge accepted”. (Bays, 2005-2014). In your post titled ” So you want an 8-team playoff? Answer these questions first” (Barnhart, 2018), published and posted on the world wide web page TMG Sports, you asked for anyone to address and answer your questions in reference to expanding the College Football Playoff (CFP) from the current 4-team playoff to an 8-team format. Within your published post, you not only asked five (5) primary questions, but also asked thirteen (13) secondary questions within the primary questions. So, which questions do you want answered, the primary or secondary? How about I address, explain and answer all. I think you need to know Mr. Barnhart, I already have addressed, researched, and examined this very subject matter about college football possessing the ability to implement an expanded playoff format of at least 16 FBS programs and or 8 FBS programs. I published and copyright protected my findings, results and research in a book titled “College Football In The BCS Era The Untold Truth Facts Evidence and Solutions” (Siggelow, 2013 & 2016). I have spent 10+ years of continuous research and still continues to research and examine this subject which more than needs an improved solution which allows all FBS programs equal, just and fair opportuniity to compete for the National Championship in college football at the FBS level. My published, copyright protected, reasearch proves, shows and explains in detail, that college football at the FBS level, can support and implement an expanded playoff format of 8 FBS programs or 16 FBS programs, without any adaptation to the season itself. I even developed a selection and seeding process and system that needs no committee to use any subjective assessment to determine who are viable and deserving programs to compete for the National Championship in college football at the FBS level. I am more of an expert on this subject matter than the experts themselves. I am more than capable of addressing your question with responses as an academic and expert researcher within the college football subject. Mr. Barnhart your questions you are asking to be addressed are “wheels within wheels, with a pattern so grand and complex that you lose sight of the way the cause can’t see the effect.” (Peart, 1980). Lets start at the beginning. The first question you should asked Mr. Barnhart is; can an expanded playoff format for college football at the FBS level under the NCAA logo be sustainable and viable for the overall sport of college football without ruining the integrity of the season, sports, traditions and rivalries throughout the course of the regular season? The answer is yes. Within the rules and bylaws of the NCAA, there is enough calender time to schedule 12 regular season games, implement either an 8-team CFB playoff and or a 16-team CFB playoff. This includes maintaining all traditional rivalry games already scheduled, implementing a NFL type scheduling format which is balanced, cross divisional, cross conference and no scheduling of lower NCAA classification progams; a.k.a. the FCS programs. The selection process of which you speak or question for whatever number of teams college football decides to select to participate for a college football playoff, must possess a hierarchial and criterion based selection process. All of which must be quantifiable and qualitative to make the selction and seeding process almost fool proof. This eliminates subjective assessment by any human committee members who possess vested interest based upon conference or FBS team relationships. The emphasis must be put in the criteria requirments in which each FBS program meets to be considered as a playoff team. By leaving the subjective assessment out of the selection process you get a fair playoff system in which FBS teams earned the right to be part of the playoffs. Your second question Mr. Barnhart; ” If you don’t want a selection committee because it’s too political, do you just give each of the Power Five conferences an automatic bid?” (Barnhart, 2018). Automatic bids should not be given to the Power Five Conference (P5). Just like you mentioned ” what do you do with a Northwestern (8-5) or a Pittsburgh (7-6)” (Barnhart,2018). I can easily flip the script and say what do you do with a (10-2) Alabama, Georgia, Vanderbilt or others. Bids to the expanded playoff should be earned not given a right to. Just like I explaned previously above, yes selection committees can be political with vested interest and seeding bias due to the fact that there is a LARGE sum of money on the table, not including being called “national champion”, hoisting the gold trophy and rings that come with the notoriety of winning the college football national campionship. A selection commmittee is only as credible as their ability to be respected on their ranking abiities to be fair, just and un-biased. What I am agreeing with is that ANY conference champion with 0-losses or 1-loss should ALWAYS be part of the playoffs. No matter which conference they are associated with. Its a very interesting dichotomy that you place value on a conferenece championship, pending on which conference you promote and or who that conference champion is. You speak highly of the certain programs from specific conferences, such as the SEC, but fail to see the underlying factors and variables that assists in their successes. Moreover, you cirticize and chastize other conference winners and devalue their success because of their team name and or the conference in which they are a member of. Within my published research in book format, I researched and incorporated the professional model theory in selecting and seeding my mock field of 16 FBS programs, which is inclusive to all FBS programs and not exclusive to a group of 66. Your third question Mr. Barnhart, “Do you eliminate conference championship games?” (Barnhart, 2018). Conference championships are basically designed for financial purpose with naming rights and or pride entitlement rights as being called “Conference Champion.” The answer to your question is, Yes you can eliminate conference championship weekend, but if and only if the CFB playoff expands to 16 teams. If the next CFB playoff move is to go to 8 CFB/FBS programs then you can still keep and implement conference championships and use those games with some value to seeding and selecting for the CFB CFP8 playoff group. Once you expand the CFB playoff to 16, then you MUST eliminate the conference championship weekends. 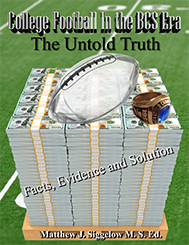 In my publish research and book “College Football In The BCS Era The Untold Truth Facts Evidence and Solution” (Siggelow, 2013 & 2016), I used the field of 16 for expanding the playoff for CFB to prove that in can be implemented and executed without extending the CFB season or changing the NCAA rules and bylaws which CFB must adhere to, to complete the season in a timely manner. Within my field of 16, I eliminated conference championship weekend and replaced it with the first round games. The first round games are played at the higher seeds home field stadium sites and on the first weekend of December. All first round games must be completed by and around 7PM Pacific Standard Time. I followed and adhered to the tournament format or brackets of 16, with understanding that every student athlete, coach, athletic director and fan knows how a tournament bracket of 16 looks and formatted. The second week of December is dedicated to student athlete final exam week. That means all CFB student athletes should have the opportunity to study, take and compelete their final exams, if applicable, without scheduled practice. Once the student athletes complete their final exams, then supervised practice can commense. I added this in as an academic reason for student athlete finals and injury restoration if needed. The third weekend of December starts bowl season for college football, I determined through research that this is the prefect time to start the Quarter Final games for the remaining eight FBS programs. Since the early bowl games stuggle with attendance and financial contributions, why not incorporate the first four bowl games; the Las Vegas Bowl, The R+L Carriers Bowl (New Orleans), The New Mexico Bowl, and The AutoNation Cure Bowl (Orlando) and or The Raycom Media Camellia Bowl. By incorporarting these four bowl games as the quarter final games you WILL SIGNIFICANTLY increase attendance, increase advertising revenue dollars, and make these four bowl games possess relevancy and prestige. The FBS programs that are already scheduled for these four bowl games can be inserted into other prestiguous bowl games with increased lucritive bowl names and payouts. The fourth week of December will be another scheduled week off for the reamining four FBS programs. Again, another opporutnity to heal injuries, rest, prepare for the Semi-Final game and possibly visit family and friends. The Semi Final games can still be played during the same time, using the same bowl games to market the final four and not change anything witin the scheduled bowl week calander of games. The National Championship game can still be played using the same format as they currently use now. This means there would be no changes with the current uses of the Semi-Final and Championship games processes, stadium sites and planning. By implementing my 16 team playoff format, CFB will SIGNIFICANTLY increase revenue dollars by a minimum of $150-200 Million dollars without advertising dollars and other tax based dollars. Let alone increase media coverage and fan attendance to these early games. Can you imagine how that much revenue can assist in college athletics in all areas and all FBS programs. Even if the next CFB playoff phase is to move to eight FBS programs, then you can still possess conference championship games and playoff using the early four bowl games as well. There is NO significant purpose to possess a home field advantage at this point of the calender year. Your comment about “The CFP is not a governing body but an association of 11 conferences and Notre Dame. There is no commissioner (although that would be a very good idea)” (Barnhart, 2018). it’s very interesting in how you made that statement. If the CFP is not a governing body, then why are their requirements to the selction process? Futhermore, why is this “governing body” only allowing access to the 67 FBS members? Moreover, how did this governing body or the sports media allow to seperate the 130 FBS members based upon a classification and or labelment of BCS/P5 and Non-BCS/G5 to create a segregated group. The most interesting dichotomy of this governing body is that this bifircated and Democritusly driven system places $50 Million dollars on the table, presents a gold trophy, presents rings to the champion and the last remaining BCS/P5 program left gets to call themselves “National Champion.” What many fail to comprehend is that the CFP, Executive Director and Committee operating with a bifurcated and Democritusly driven system needs to step aside before lawsuits arise. The ultimate conclusion is that college football DOES need a commissioner that possesses no vested interests and no bias. That commissioner must operate with integrity and using the Stuart Mills Utilitarianistic desire to make sure that CFB and that all FBS programs are given fair, just and equal opportunity for the money on the table, the gold trophy, the rings and to be called “National Champion” of CFB. Your fourth question Mr. Barnhart ” What about the Group of Five? ” (Barnhart, 2018). The facts are, college athletics is and will always be operating in a business manner, generating 9-digit revenue dollars before the decimal point and draws 37+ million college football fans on an annual basis. So my concern is, why is this CFP only for a select group of FBS programs. When in fact; all 130 FBS programs operate under the NCAA blue logo, abide by all NCAA Bylaw, operate under Title IX rules and regulations, must meet NCAA Bylaw 20 to obtain the FBS classification standards under the NCAA rules, monitor student athlete academic achievements and eligibility requirements, in addition too maintaining 88 NCAA Championship sports. The primary question; why is it that the ONLY NCAA sponsored sport of college football, at the FBS level, in which the FBS schools are labeled or classified as Non-BCS or the Group of Five (G5) are prohibited and vehemetly denied access to the CFP playoff. However, the G5 FBS programs are only eligible for the “bridesmaid” prize of one of the New Year’s Day Bowl Six games. Moreover, that G5 FBS group is only eligible IF and ONLY IF they meet “certain and specific selection requirments based upon a subjective process within a committee with Democritus principles.” The answer to your question is why not the Group of Five (G5) they are MORE than credible to participate for the $50 million dollars on the table, the gold trophy, plus the rings and the notoerity of being called “National Champion”. Maybe Mr. Barnhart you could use a reminder or mental refresher of the historical successes of the Non-BCS/P5 FBS programs from 1996 to the present, prior to any bowl games or conference championship games were played. (1996): Army (10-1), Wyoming (10-1) and BYU (10-1); (1997): Air Force (10-2); (1998): Tulane (11-0), Marshall (10-1), Miami (OH) (10-1) and Air Force (10-1); (1999): Marshall (11-0); (2000): Toledo (10-1); (2001): BYU (12-1), Fresno State (11-2), Louisville (10-2) and Marshall (10-2); (2002): Boise State (11-1); (2003): Miami (OH) (11-1), Boise State (12-1) and Bowling Green (10-2); (2004): Utah (11-0) and Louisville (10-1); (2005): TCU (10-1); (2006): Boise State (12-0) and Louisville (11-1); (2007): Hawaii (12-0), BYU (10-2) and Boise State (10-2); (2008): Ball State (12-0)and Boise State (12-0); (2009): Cincinnati (12-0) and Boise State (12-0); (2010): Nevada (12-1), Boise State (11-1); (2011): Boise State (11-1) and Houston (12-0); (2012): Northern Illinois (11-1) and Kent State (11-1); (2013): Northern Illinois (12-0), Louisville (11-1), Central Florida (11-1) and Fresno State (10-1); (2014): Marshall (11-1); (2015): Houston (11-1); (2016): Western Michigan (12-0); (2017): Central Florida (11-0) and Memphis (10-1); and (2018): Central Florida (11-0). To conclude this question in which you asked Mr. Barnhart, it should not matter what classification these FBS programs are. What does matter is that each of the 130 FBS programs possesses student athletes which were recruited to compete at the highest level of FBS football, under the NCAA blue logo. Each student athlete receives the same scholarship opportunities, plays on the same field size, same number of game time required allotted minutes to play the game, same number of games and so on. However, when its time to hand out playoff spots there is a subjective system which micrscopically find ways to eliminate or make it more than impossible for the selection committee to select a G5 program for the CFP playoff. The current selection process indicate that there is a need for a change in expanding the playoff numbers for college football. That change can either be made by a group decision to be more utilitarinianistic and adopt the Sturat Mills model or maybe by a higher power that can enforce those changes and implement other a required change in how college football determines their national champion. This means there needs to be a commissioner who can oversee the new playoff process and design the qualitative and quantitaive requirements to be playoff eligible. This brings us to your last question Mr. Barnhart, “Where/when are you going to play the quarterfinals?” (Barnhart, 2018). I already gave a detailed explanation on how the playoff system can be implemented in a previous question above. I am more concerned about these questions and comment; “Well, let’s take Alabama. Final exams in Tuscaloosa are Dec. 10-14. Do players get exempt from final exams in order to concentrate on the game? Do they go through their regular exam schedule, squeeze in football preparations and then play football on Saturday? Do you play the game a week later or a week earlier? Do you move final exams to accommodate the playoffs? By the way, Fall Commencement at Alabama is Dec. 15. Do you move graduation day for a football game?” (Barnhart, 2018). My first reaction is why do we have to accomodate Alabama and when THEY take their final exams. It should be about ALL student athletes academic successes. Making sure they are prepared for final exams when the opportunity arises. Within my research and expanded playoff format, which I already explained, gives a detailed description of a final exam week placed within the playoff system. The playoff is not always about the SEC or ALABAMA. The system needs to be accomodating to all. Your question about Fall Commencement, is a weak arugument. Tell me Mr. Barnhart, how many student athletes and or students actually participate in Fall Commencment. Many would rather participate in the Spring end of the academic calendar commencement with friends to enjoy the graduation experience. So the Fall Commencement argument possesses no validity to the playoff format. I think if it came down to commencement or playing in a playoff game; I would believe without a doubt that the student athletes would plan, prepare for a National Championship run over graduation. Graduation comes around often, but playing for a National Championship comes rarely. To draw a conclusion on this lengthy post in which I addressed your multiple questions; the CFP and previous BCS systems have been proven to be a bifurcated and Democritus systems. Only serving the FBS brands which gives them the best perception as being the best. In time, either sooner than later someone is going to use the hatchet, axe and saw on the power brokers of college football and ban together and force change. I can hypothesize that the power brokers do not care about the group, just protecting their own vested interests for the “Big Money”. The playoffs for college football will expand. Not sure when and how it will expand. But rest assured that “Big Money” and the power brokers will take care of themselves first before the group. Barnhart, Tony (2018). ” So You Want an 8-Team Playoff? Answer These Questions First”. Published on the World Wide Web: TMG College Sports: For More Than The Score. Retrieved from the World Wide Web website; https://collegesportsmaven.io/tmg/tony-barnhart/so-you-want-an-8-team-playoff-answer-these-questions-first-s5ntVLLHKUSWeF8QD6N4Dw/. Retreived on December 8, 2018. Bays, Carter (Excutive Producer). ” How I Met Your Mother” (Television Series: 2005-2014). Character Catch Phrase “Challenge Accepted”. Character Barney Stinson. Played by Neil Patrick Harris, Actor. Los Angelas, CA. Columbia Broadcasting Company. CBS. Peart, Neil (1978). “The Trees”. Recorded by Rush. Hemispheres. Available on CD, Cassette and Record. Recorded at Rockfield Studios. South Wales UK. Anthem, Atlantic, Epic/Sony, and Mercury. Released 7/1978. Peart, Neil (1979). “Natural Science”. Recorded by Rush. Permanent Waves. Available on CD, Cassette and Record. Recorded at Le Studios. South Wales UK. Anthem, Atlantic, Epic/Sony, and Mercury. Released 1/1980. Peart, Neil (1985). “Big Money”. Recorded by Rush. Power Windows. Available on CD, Cassette and Record. Recorded at The Oxfordshire; Sarm East Studios, Angel Studios and Abbey Road Studios, London; AIR Studios. Montserrat. Anthem, Atlantic, Epic/Sony, Mercury and Vertigo. Released 10/1985. Siggelow, Matthew J. M.S.Ed. (2013 & 2016). “College Football In The BCS Era The Untold Truth Facts Evidence and Solution”. Avaliable at lulu.com. Self Published Research and Copyright Protected. Since 2007, I have been researching college football at the highest level of the FBS, under the NCAA blue logo. With the ultimate objective being how college football at this level can implement an expanded college football playoff without causing MAJOR debate and controversy. I have been successful with this idea and concept. All while I continuously collecting quantitative and qualitative data, recording, documenting, examining multiple variables with those data points, analyzing that data and creating a MOCK/Fictional College Football Playoff field for 16 FBS members since 2007. MY expanded playoff format is an “INCLUSIVE” playoff format for all competing FBS programs during that college football season. The current and bifurcated CFP system is an “EXCLUSIVE” playoff format for only 66 FBS prorgams all of which are media classified as Power Five Conferences and Members ONLY. Within my published research and book, which examines college football historical evidence from the 1996 CFB season and forward to the current and future seasons. I was able to develop the right system to select and seed the field of 16. My field of 16 is selected by a criterial based set of data points which are qualitaitve and quantitive. Very Similar to using the the professsional model theory in which the National Football League (NFL), National Basketball League (NBA), National Hockey League (NHL) and Major League Baseball (MLB) determine their playoff participants. All of which are criterion based with playoff elibility rules and requirements that ALL Teams, Players, Coaches, Owners and Fans know what it takes to make the playoffs. There is no second guessing, no “subjective eye test”, no SIGNIFICANT advantages in their game schedules, no playing lower level farm club systems to earn extra victories and pad their personal and team statistics. What the current and past CFP committee(s) possesses are selection biases with Democritus values, based upon financial investments from ESPN, committee bias with the selection committee possessing direct relationships to specific power brokers and fails to examine the possible implemention of a playoff process which is inclusive for all FBS programs who compete in football, under the NCAA blue logo. The CFP system is a small step forward but still a Democritusly driven bifurcated system. The current system prohibits the G5 Conferences and programs to participate or make the criterion so subjectively bias to be considered for this playoff format. The only prize the G5 Conferences and Programs are eligible for is what I call the “bridemaid prize”. One bid, if they meet specific criterion to a New Years Day Six Bowl Game. No matter if that G5 program ends the seaons with 0-losses or completed successive FBS seasons with 0-losses. If you surveyed and or asked college fans, coaches, players, administrators and sports media “experts” one specific question, they would more than likely agree and come to the same conclusion, with a SIGNIFICANT percentage rate of 90% or greater, in favor that college athletics is a business. If college athletics is a business, then why has there not been legal action taken against the power brokers. If the system were ever challenged by the Group of Five (G5) Confernece Commissioners, Athletic Directors, College Presidents, College Board of Trustees, Coaches and Players all bonded together; there is a strong and significant possibility of a a violation within the Sherman Act of 1890. There is enough sufficient evidence to process this claim based upon my published research and peer reviewed educational research where Doctoral professors have published their thoughts and findings within this subject matter. If there is enough evidence, then the Clayton Act of 1914 would be imposed and protect the G5 FBS programs and conferneces. There is a chapter dedicated to this very topic within my book. The interesting dichotomy when comparing playoff formats of the CFP and my expanded playoff format of 16, at least I can explain the function and how the “wheels within wheels” (Peart, 1980), works “within the spiral array” (Peart, 1980). My expanded field of 16 playoff is easy to understand and could generate up to a minimum of $150+ Million dollars in revenue which would benefit college athletics as a whole. Here are the 2018 College Fooball Playoff Brackets and Dates. This is a mock simulation of an expanded playoff bracket based upon the professional model theory. This is all part of my research to significantly prove that an expanded college football playoff of 16 FBS programs, which is inclusive and not exclusive, can be implemented. ALL GAMES must be started before 7PM Eastern Standard Time. This is the Academic Rule in which i developed to assist with student athlete acadademic study time. Starting Monday December 3, 2018; This should be Academic Finals week for the student athletes. No Structured/Coach Supervised practice can happen. ONCE ALL student athletes complete their FINAL Exams, then Supervised/Game Planned/Head Coach and Assistant Coach Practices can resume for the remaining FBS programs who advanced to the Quarter Finals games with the four bowl games. The remaining four winners from these First Four Bowl games will advance to two (2) of the four (4) Major Bowl games on New Years Day which includes The Rose Bowl, The Sugar Bowl, The Orange Bowl, the Fiesta Bowl. This means there would be another week off for the remaining FBS programs to compete in these bowl games. The remaining two (2) FBS programs from this expanded playoff format will participate in the National Chamionship Game on that following Monday in January, on the said, assiagned date in which the National Championship Game is already schedueld to be played. I wrote about this same concept and idea with a special chapter dedicated to this process in my book. It’s well thought out , self explanatory and eliminates subjectivity; also known as the eye test. Ther expandedplayoff format takes into account for time off for minor injury recovery and academic purposes. What many of the sports madia fail to understand is that all FBS student athletes are recruited to play across the country. However, only in FBS Football under the NCAA blue logo is where the student athletes for the G5 Conferences and Programs are in-eligible to compete for a “National Championship”. These same student athletes that compete for the G5 Conferences and Programs; are eligible for the same academic scholarship, abide by the same NCAA academic rules, abide by the same Bylaws within and under the NCAA Blue Logo, but are prohibited from competing for the CFP playoffs all due to the fact of who they are playing for. If this is not a bias or a prohibited of competing for and being called National Champion, then the CFP commiitee and executives need to be brought up on charges.